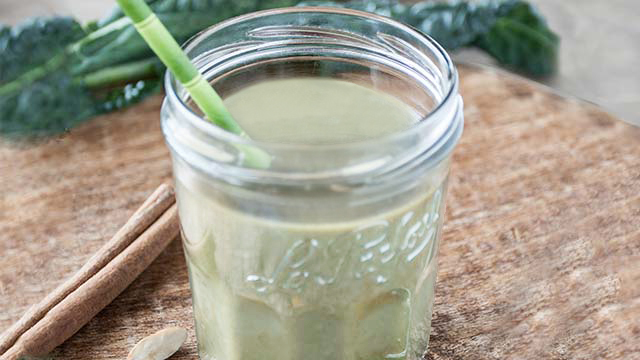 With all its anti-inflammatory essential fatty acids, this smoothie is a ridiculously delicious way to promote detoxification, skin health, and nervous system support. Bonus: the healthy fats help stabilize your blood sugar. Recipe courtesy of Andrea Bemis, chef/writer of the blog Dishing Up The Dirt and owner of Tumbleweed Farm, located in Hood River, OR. Place all ingredients into a blender, blend until smooth, and enjoy! 21 people have left a comment. Join the conversation! Loved this! Creamy and filling, I didn’t have frozen pineapple on hand so I used frozen mango and it was delicious. Thanks for the recipe! This may be a dumb question, but the recipe makes 2 servings…is that one for AM and one for mid-day snack later? Or, Drink 1/2 serving in AM and the other 1/2 for mid-day snack later? I had to make a few revisions – first and foremost I cannot tolerate the flavor of cilantro (tastes like soap) so I used spinach instead. I also added a peeled kiwi , a tablespoon of chia seeds, and a tablespoon of coconut oil (which needs to be liquefied and added gradually). I’ve made it with and without the banana and like it both ways. The avocado makes it extremely smooth, so the banana isn’t necessary. My husband and I really love this one! This is my favorite smoothie, perhaps of all time. I think I could drink this every single day! It is delicious and makes me feel awesome, like I’m glowing from the inside out! This smoothie is delicious and filling!! I didn’t have cilantro but still really good. Can you substitute chia seeds for the flax seed? Excited to try this! Hi Alanna! Yes, you can substitute chia seeds for the flax. I hope you enjoy it! I am not a fan of this one. I love all the ingredients but just blended together, as a salad great! Also I am surprised there is more avocado in the salad later today, but I love it so no complaints. Fresh lemon juice just brightened all of these yummy ingredients — delicious! I hope this isn’t a stupid question, but it seems like there’s a difference between the coconut milk that you buy like regular milk and the type you can buy in a can. Am I right? And if so, how do I tell which one is the right one to use? Thanks!! Hi Kate! That is a great question! There is a difference, and you may use either one. The coconut milk in the can is thick and may require water added. The milk that comes in a box has water added for you, and is sometimes fortified with nutrients such as vitamin D and calcium, and possibly sugar. add a little mango to rock your world!!! This smoothie is delicious and so refreshing! I cut back the cilantro from 4 T to 1 T and due to other’s comments that the cilantro was overpowering – 1 T worked great. I do not really like this smoothie. The cilantro ruins it for me, so if I made it again I would skip that ingredient and maybe add some spinach. Not spinach a pinch of salt. I substituted yogurt for banana but I had to had spinach if sel Gris salt and lemon juice. I think my avocado overwhelmed my pineapple. Tastes very tropical on this cold day! This smoothie was so refreshing and delicious! I substituted coconut milk with almond milk.